Gums are made of soft tissue and they surround the bottom portion of your teeth. Gum disease, or periodontal disease, is the leading cause of tooth loss in adults. Chronic gum disease may contribute to the development of heart disease. Taking care of your gums is just as important as taking care of your teeth. Gum disease is an inflammation of the gums that is caused by bacteria in plaque, a sticky film that collects on teeth and gums. Plaque can build and the bacteria can also infect the bone that supports the teeth. Gum disease can cause gums to pull away from the teeth. This can form pockets between the teeth and gums in which germs can become trapped. This causes the bone around the teeth to become weak, and the teeth to become loose, or fall out. Gingivitis is the earliest stage of gum disease. It is inflammation of the gums caused by plaque buildup at the gumline. The plaque irritates the gums causing gingivitis. There may be some bleeding during brushing and flossing. Damage can be reversed at this stage since the bone and tissue that support the teeth have not yet been affected. Periodontitis is the stage in which the bone that supports the tooth are irreversibly damaged. Your gums may begin to form a pocket below the gumline, which traps food and plaque. There may also be some early bone loss around the teeth. Proper dental treatment can prevent further damage. Advanced Periodontitis is the final stage of gum disease in which the bone is destroyed. This can cause the teeth to loosen or fall out. It may be necessary to remove the teeth. Each person may experience periodontal symptoms differently. The early stages of gum disease may be reversed with proper brushing and flossing that help keep plaque from building up. A professional cleaning by your dentist is the only way to remove plaque that has built up and hardened. 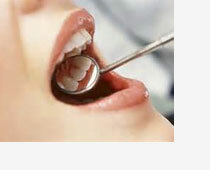 The dentist will clean the teeth to remove the plaque above and below the gumline. If your condition is more serious, a root planing may be necessary. Root planing helps to smooth root irregularities making it more difficult for plaque to build up. Early stage gum disease can be prevented or treated by scheduling regular checkups. If your condition is advanced, your dentist can determine the necessary treatment.